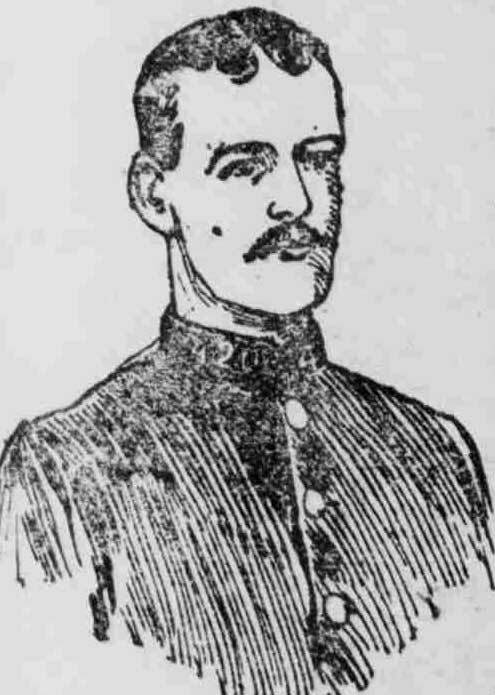 Police Constable Ernest Thompson was the officer who found the body of Frances Coles on Friday 13th February 1892. She may, or may not, have been a victim of Jack the Ripper, but hers is the last of the names to appear on the Whitechapel Murders file. PC Thompson hadn’t been in the police force all that long when he made his gruesome discovery; indeed the night on which he found the body of Frances Coles was his first solo beat; and the memory of this baptism of fire would stay with him for the remainder of his days. What he would not have known at the time of his discovery was that, just a few years later, he too was destined to become a murder victim, and his name would join the ever growing list of police officers who have sacrificed their lives in the line of duty. The man responsible for murdering Ernest Thompson was 41 year old Barnet Abrahams, a Jewish cigar maker, residing at 50 Newark Street, Whitechapel. The policeman’s death caused genuine shock, sadness and revulsion in the district and the newspapers reported on the crime extensively. “A police-constable, who distinguished himself at the time of the Jack the Ripper murders in Whitechapel, was yesterday morning stabbed to death. It seems that about 1.30 a.m. Constable William [sic] Thompson was attracted to a few loiterers in the neighbourhood of a coffee-stall in Union-street, off Commercial-road East. There was a scuffle, and one of the men, Barnet Abrahams, attacked the officer, stabbing him twice in the neck. Thompson struggled with his assailant, and whilst so engaged Police-constable William Hurding, 51 H arrived on the scene. Hurding rendered assistance, and the man was overpowered. Hurding then turned his attention to Thompson, who had fallen to the ground, but he died in a cab on the way to the London hospital. Constable Ernest Thompson. From Lloyd’s Weekly Newspaper, December 2nd 1900. At the subsequent inquest into the death of Ernest Thompson – held at Limehouse Coroner’s Court, with Wynne E. Baxter, Coroner for East London presiding – several witnesses came forward to state what they had seen of the crime. William Ward, aged 45, a labourer said that he had been heading home along Commercial Road in the early hours of Saturday morning, 1st December 1900, when he met PC Thompson, who was standing on the corner of Union Street. Ward said that, since he had previously been a warden at Pentonville Prison he had got to know PC Thompson and so, on seeing him that morning, he had stopped for a chat. As they chatted, a group of six or seven men and two women on the other side of the road began causing a disturbance by “shouting and using obscene language.” The policeman, therefore, approached them and asked them to move on, telling them that if they did not he would take them into custody. At this point the group dispersed, six of the men heading off leaving Abrahams and the two women standing by a coffee stall. Barnet Abrahams Appears In Court. William Butcher, who at the time of this disturbance was in charge of a coffee-stall on the corner of Church Lane, testified at the inquest that, at around one o’clock, Abrahams had come to the stall with two women and had ordered coffee, eggs and bread and butter for his female companions. After they had finished their refreshments they started walking in the direction of Aldgate. As they walked he heard Abrahams start laughing and singing. The women, Butcher said, headed off in the direction of Aldgate, and Abrahams headed towards Union Street, with PC Thompson walking behind him. At 1.20am on the morning of December 1st 1900, Police Constable David Tittle was one of a group of officers who were in the process of escorting five prisoners from Leman Street Police-station to Arbour Square Police-station. They were walking in single file along the south side of Commercial Road. He saw PC Thompson standing on the north pavement near to Union Street. “…yesterday morning some half a dozen policemen were in charge of the removal of prisoners. They were passing on the other side of Commercial-road when they saw Thompson struggling with Abrahams, and one of them says be saw the prisoner’s hand descending on Thompson’s neck, although he was too far off to see an instrument. Two of these policemen at once went to their comrade’s assistance, and one of them is said to have seen the prisoner throw away a knife. It is at least beyond doubt that an ordinary three-inch blade pocket-knife, covered from tip to shaft with warm blood, was picked up close to where the policeman and the prisoner were struggling. Thompson was at once seen to be in a serious condition. His neck and clothes were covered with gore. From The Illustrated Police News. Copyright, The British Library Board. Barnet Abraham’s defence was that he had acted in self defence. He claimed that Thompson had, in fact, attacked him and, using his truncheon and his fists had inflicted severe injuries on his person which were clearly visible when he had appeared at Thames Police-court on the 1st of December. He claimed that these wounds had been inflicted by PC Thompson, whom he had stabbed in self defence. However, Police Constable Albert Timms, who had helped put his injured colleague into a cab and had gone with him to the London Hospital, was emphatic that Thompson had not drawn his truncheon. According to Police-constable Hurding the wounds that Abraham’s had suffered were, in fact, inflicted as he struggled with himself and the other officers after he had stabbed Ernest Thompson. He was found guilty of manslaughter and was sentenced to 20 years penal servitude. There was a huge outpouring of sympathy towards the deceased PC Thompson and towards the widow and three children – the eldest only four years old – that he had left behind. “In the presence of a very large gathering, the funeral of the late officer took place at Bow Cemetery. The cortege left the house of the deceased officer in Princess Street, Stepney, shortly before one o’clock, and – headed by the band of the division to which deceased had been attached, and which played the “Dead March” in “Saul” – proceeded on its melancholy journey. Behind the carriages containing the relatives and friends of the deceased, considerably over 3,000 officers and men of the Metropolitan Police followed. All along the line of the route the streets were densely packed with sympathising spectators. The blinds of the houses were drawn, and in some cases the shopkeepers closed their establishments entirely whilst the procession proceeded solemnly along. At the cemetery an impressive service was held. From The Illustrated Police News. 15th December 1900. Copyright, The British Library Board. One of the aspects of PC Thompson’s career that several newspapers commented on was the fact that he had, possibly, come close to catching the killer of Frances Coles in the act of murder. And, if Coles was a victim of Jack the Ripper, as several newspapers were claiming she was, then he may well have seen the Ripper. “Thompson, the deceased policeman was about 36 years of age. He had been about 10 years in the service, and had been attached to the H division of the force. The last crime the “Ripper” is credited with took place in Swallow-square, which was on Thompson’s beat. Recently, at the Ripperologist 21st Birthday Conference, Blue Badge Guide David Thompson gave a moving talk on the life and death of PC Ernest Thompson, who was his great-grandfather. That talk is now available on the Ripper Podcast. To hear it, please click here.